In the dead of night, while Abram lay somewhere between waking and dreaming, God made a promise that changed the course of history. But promise is too light a word… It doesn’t carry the weight that it does in this event. In today’s verse, God made a covenant with Abram that showed him how deadly serious he was about making good on his word. Here’s what was going on. Just a few verses earlier, God asked Abram to bring, “a heifer three years old, a female goat three years old, a ram three years old, a turtledove, and a young pigeon” (Genesis 15:9). Then, all the animals except the birds were cut in half (Genesis 15:10) and laid on the ground. There was a path between the bodies and the fire pot and flaming torch floated over it. Just like at the burning bush (Exodus 3:2), on Mt. Sinai (Exodus 19:18), and on Mt. Carmel (1 Kings 18:16–45), the flames and smoke represent God’s presence. Now imagine this scene. Orange light from the flaming torch flickers across the animals split in two on either side. The smoldering pot floats between them. God’s nature is faithful. His word always comes to pass. He is so serious about keeping his promises he would take such bold action in front of Abram. However, this covenant is kept and fulfilled in the books of Exodus and Joshua. We know how radical God is about keeping his promises, because he did give up his own life on the cross nearly 2,000 years ago. 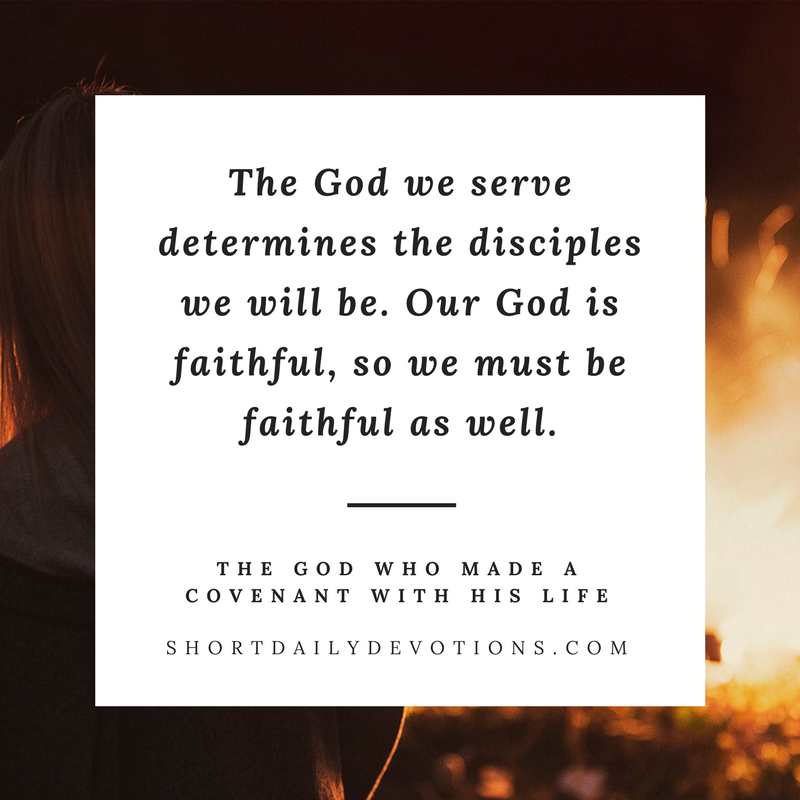 The God we serve determines the disciples we will be. Our God is faithful, so we can be faithful as well. Does God’s seriousness about his promises impact the way you make and keep yours? Devotion by Jordan Loftis. He is editor of Short Daily Devotions and author of The Men With Bare Feet.